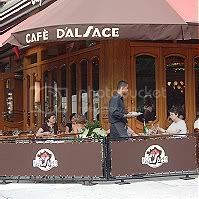 Cafe d'Alsace has been having a bit of a Pig Fest all this week in honor a vist by the father of the chef. The chef is Philippe Roussel and his father is Remy. I do have to apologize for the pictures. I forgot my camera so these have been lifted from the internet. If I ever get back here again, and I might because the food was delicious, I will take my own pictures and post an update. The weather yesterday wasn't quite a pleasant as it looks here. In fact about two minutes after our arrival there was a torrential downpour complete with lightening and thunder. It was a good thing we made it in time or I would have been in deep trouble. 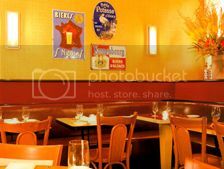 The restaurant is located on the corner of 88th and 2nd Avenue. For some reason I though it was on 86th and and 8th Avenue, which would have put it in the middle of Central Park. We got off the subway at 86th, but on the west side so we ended up taking a cross-town bus. Kind of a nice ride throught Central Park. The threatening weather did add an element of tension though. The restaurant was quite crowded and a bit darker than these pictures show. 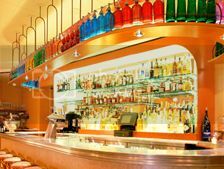 The bar is quite nice, but I didn't have a chance to have a drink at it because our table was waiting for us. Coincidently, our table was the one in the corner in this picture. The Pig Fest aspect of the evening consisted of a couple of pork specials on the menu, but no pig roasting on a spit in the middle of the dining room. The Mysterious Chinese Woman and I shared a delicious wild mushroom ravioli with shaved truffles on top. I ordered the combination plate of pork belly and snout (hopefully not the snout of the pig that found the truffles). The pork belly was kind of like a combination of pork roast and bacon and was okay, but nothing special. The snout, however, was delicious. Kind of like a spicy sausage with a ring of fat around the outside. It came with cabbage and mashed potatoes and greens tossed with chunks of bacon. The Mysterious Chinese Woman opted for duck and it was prepared with what looked and tasted like raspberries and a raspberry reduction. It was very good. They had a very nice beer menu and the sommilier was quite knowledgeable. 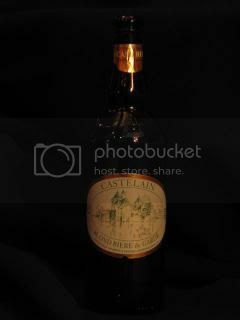 We started out with a bottle of Castelain Blond Biere de Garde. It was originally brewed for farm workers field hands. It is usually brewed in the fall and then stored for summer consumption. It was very good and I would certainly buy it again. I hope my local beer store has it. It has a nice golden color with a bit of a citrus flavor to it. It came in a large, 25 ounce bottle and cost about the same as a cheap wine (cheap for a restaurant anyway) $19 or $20. All and all it was a very nice evening. I finished it off with a couple Stregas and espressos and we took the correct subway home.